Paskong Pilipino Shopping Expo Year 3 - A vibrant event that centers on the Filipino family celebration. This grand event will enjoy vigorous advertising promotions through print and media advertisements. We will be using banners, giving out thousands of flyers and utilizing the Internet, TV, & Radio. There will be a lot of well-known personalities from the showbiz industry, and we will be getting a lot of mileage from top broadsheets and TV news programs and shows. An effective zoning policy and ample spacing will help to maximize each participant’s sales potential. Furthermore, to encourage more spending from customers, we will be providing credit card processing services for this event. The event will feature various entertainment programs and activities to add up to the celebration like live band featuring local artists, fashion show, cultural show, and raffles among others. This event offers a lot of benefits to participating businesses as it expose them not only to more customers but also to a number of suppliers. campaign to create awareness and generate huge crowd of shoppers. ***All Major Credit Cards Accepted! 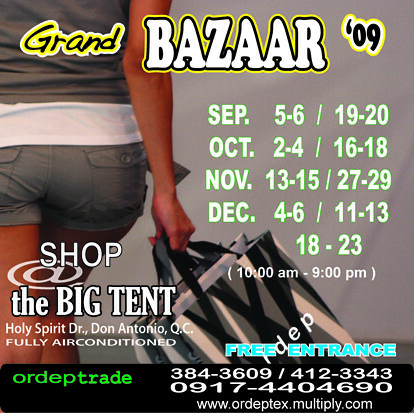 Great Links Events Management is the exclusive organizer of “Paskong Pilipino Shopping Expo Year 3”. Contact Alan Ocab thru tel. nos. 824-4337 / 824-3247 or 0917-827-6190 to report the groups or individuals posing as co-organizer of this event. Don't forget to bring your shopping bags for your Early Christmas shopping! 2. Kids should present the booklet to the respected stores and booths in order to get the freebies. No coupon, no treat/activity. 3. Registration starts when the mall opens at 11 AM. For more information, please call our Concierge Hotline at 757-4853. Costume and Candies Oh My! Who's going to bring home goodies this time? Games, treats & surprises galore. Fun activities you can explore. C'mon and watch Miki Hahn and Freestyle perform! InterContinental Manila is all set for Halloween. Special room packages and a spook-tacular party are brewing at the hotel. -- Tickets for 1 child and 1 adult to the Little House of Horror party at the Grand Ballroom on October 31. Kids in their Halloween costumes will receive a treat and parents can share in the fun by doing a trick to get even more treats during their stay. Additional treats include 20% discount at any of the hotel’s restaurants, 10% discount at the Suriya Spa and Timezone and Active Fun game cards. Each room night and every P4000 single receipt in any of the restaurants will earn guests a raffle coupon to join the hotel’s Ruby Anniversary Grand Raffle. Opens its Little House of Horror once again for a doubly fun and exciting afternoon for kids and adults. 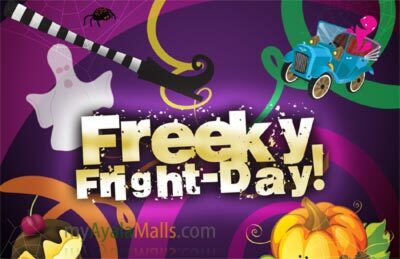 Games, activities, booths, mascot appearances, prizes, food and drinks and the most-awaited trick or treat are in store for guests. Everyone is encouraged to dress up in their best Halloween costume to bag the Best in Costume award and win a special prize. Admission is priced at P750 for kids aged 8 years and below and P950 nett for adults. For reservations, please call 793 7000. Room rate is subject to service charge and government taxes and may not be combined with any other special offer. 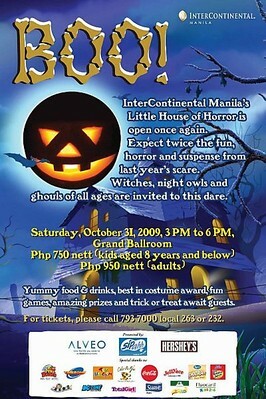 Bonifacio High Street Flagship Store will be celebrating Halloween on October 30 and 31, 2009. 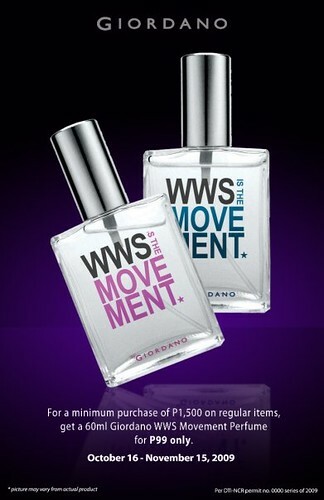 For every 1,500 purchase of any regular-priced item from Giordano, get a limited edition Giordano Philippines WWS is the Movement Cologne. 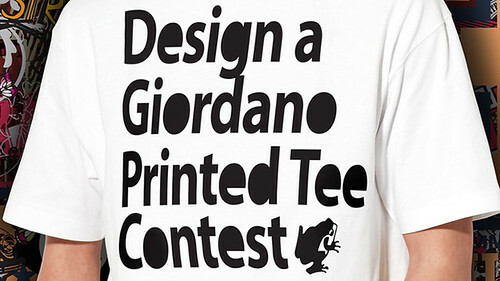 Calling all Artists, Graphic Artists, Designers and everyone else...Join our 1st ever Giordano Graphic Tee Design Contest. Entries will be accepted until November 15, 2009. Visit www.giordano.com.ph for complete mechanics! There are a lot of exciting... prizes at stake! Spread the word to your friends, family, officemates, and classmates! Kakaba-kaba ka ba? Ho din kiasi! The Center for East Asian Languages, in cooperation with Fully Booked, presents a unique and interesting talk fit for this season of ghosts and ghouls: Kakaba-kaba ka ba? Ho din kiasi! Join us and learn with Geomancer Greg Ciocson as he talks about Chinese Feng Shui, rituals, traditions, and superstitions and discover how the Chinese people wish for fortune and luck. The talk will be this Saturday 1:00PM 24 October, 2009 at the Forum. Register now at the Customer Service counter of Fully Booked. Spend A Saturday Workshop for Halloween with Tony Perez at Kusina Salud! Kusina Salud (on the way to Tiaong, Quezon Province) invites you to a day-long (9:00 AM - 6:00 PM) workshop with Tony Perez and members of Santeros Filipinos to be held on Saturday, October 24, 2009. The package of Php 660 includes a lunch and two meriendas uniquely concocted by Kusina Salud! 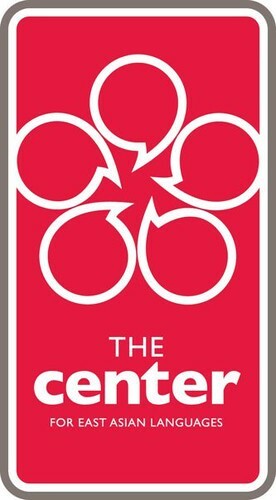 The workshop is designed to activate participants' psychic vision (clairvoyance), psychic hearing (clairaudience), psychic intuition (clairsentience), psychic feeling (empathy), and, should time permit, psychic smell (clairaroma) and psychic taste (clairgustus), toward the objectives of developing heightened creativity, introspection, and spiritual insight. Hands-on exercises will include magickal warding, casting spells, creative visualization, scanning, and attunement to nature spirits. You do have to bring a pendulum, some drawing paper, color crayons, and a blindfold. For details, call or text Nina at 0-921-772-6985. 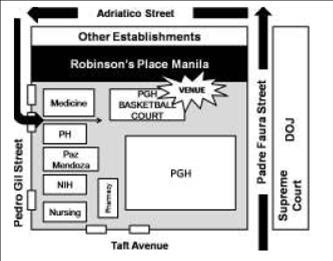 Sunday, October 24, after breakfast, Tony Perez and Santeros Filipinos depart for Manila. Get a complimentary Eco-Friendly bag from Powerbooks for every P600 single receipt purchase. Do your part in saving the environment! Promo runs from October 19, 2009 until supplies last. Excitement is definitely in the air. The year 2010 is in sight and what better way to take stock of things achieved and new dreams to pursue than a gathering of like-minded empowered girls! This year to launch the 2010 BDJ Power Planner, we’ve decided to have a get-together that’s bigger, better and loaded with lots of heart. Introducing…. the first ever “BDJ Fair: Exceeding Boundaries: Give More, Live More!”, the get-together will hold talks with experts on beauty and fashion as well as accomplished women in their respective fields. We have various booths and lotsa activities lined up for you, check the details below, and register! =) As part of BDJ’s social responsibility, the BDJ Fair is also a fundraising activity for the rehabilitation of Ondoy victims. 100% of the event proceeds will be donated to a deserving community/group affected by Typhoon Ondoy. Take this HATHA YOGA class sampler by Pulse Yoga, and savor the benefits of a relaxing yoga class. Don’t worry, this is for beginners. Attire? Normal gym attire, no need for shoes, class is done barefoot. Branding is not limited to a product or producer. It's also an important component of your career path The rising star will always be chosen over the slovenly sloth or the timid workhorse. It is not enough to work hard, you also have to make it known that you are a company asset. Learn how to rise through the ranks through proper image management and work ethic. Learn the do's and don't of office decorum as well as valuable tips on how to rise above the herd. Hear it firsthand from a young professional who has managed to leave her mark at her chosen field! The hunt is on! Enjoy the company of fellow BDJ girls as you seek out clues and treasures all over the BDJ Fair and Eastwood. This is your chance to make new friends and test your detective skills in the process! There will be exciting prizes that await the victors at the finish line. So bring your zest and excitement (and maybe some comfy shoes!) cause you will be searching high and low for some very interesting clues. Game on! Oh the places you can go! With lots of determination and a steely resolve, anything is possible! Experience new highs in this wonderful sport where endurance is tested at the heart of the mountain range! Become inspired to take fitness to the next level as you learn about the niche sport of skyrunning and how it can take you to such great heights. 6:15 to 6:30pm: I WANT TO BE SUPERMODEL! We know your gorgeous! Go outside your comfort zone, strut your stuff! Get some coaching and styling from Folded and Hung and Jellybean’s best directors and stylist! Not all fashion and beauty rules are created equal….and sometimes rules ARE meant to be broken. That color scheme or capped sleeve could have been a golden nugget last season but it could be the newest fashion disaster today. So don’t let the trends dictate your style. Trust your instinct and think outside the box! In this talk, learn what’s stylish, what’s not, and what’s always in no matter the date or season! Barbi Chan is the chief make-up artist of Maybelline New York. Her prolific work covers a ranges from intimate weddings to glamorous photo shoots for magazines. But her talent in making every woman beautiful is always spot on. Dona Cuna-Pita has years of experience in the field as fashion as the former Fashion Editor of Cosmopolitan and Associate Fashion Director for Summit Publications. She is a trusted stylist of numerous celebrities and is known for her uncanny fashion predictions and never failing superior style. • Free Fortune Telling: In classic fair fashion, have your fortunes told by Maharlika Infinitum. 1 Little 2 little 3…LITTLE RESCUE PLAYDATE! THIS IS JUST THE FIRST RUN…PLS HELP SPREAD THE WORD SO WE CAN PLAY WITH MORE KIDS! After ONDOY, after PEPENG- Reduce! Reuse! Recycle! Now more than ever! Old TVs, CPUs, monitors, etc. For inquiries, please get in touch with Anna De Guzman of the UP Biology Majors Society thru anna16_deguzman@yahoo.com. Robinson's Malls Giant Markdown Sale. October 16, 2009- up to 12 midnight. Enjoy 10% off on your first Ready for Rain purchase by typing "ILOVERAIN" at checkout. One time use per customer. Valid until October 15, 2009. ITs All for Mother Earth Eco Fair! You are all invited to the Poveda Class of 1989's ITs All for Mother Earth Eco Fair! 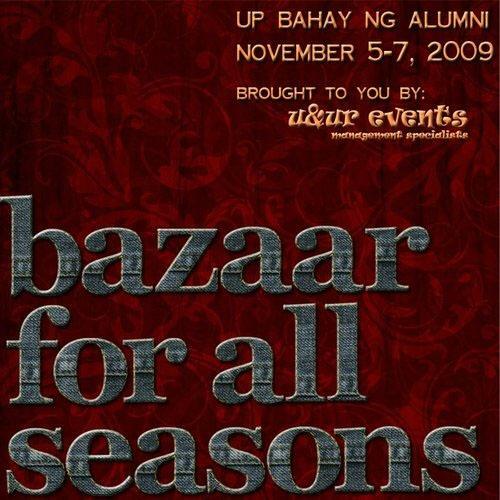 October 18, 2009 at St. Pedro Poveda College Covered Courts from 9am to 4pm. Join us on our 20th Anniversary as we embark on an eco project. As responsible social citizens, we believe that together, we can champion the cause to make our planet a greener and safer place to live. Various activities are planned for the day: storytelling, seminars, exhibits, and a bazaar offering earth-friendly products and services. It will be a fundraising project for the benefit of Bantay Kalikasan and the St. Pedro Poveda College Gym. Slots still available to those who want to sell their earth friendly products. Email us: it.batch89@gmail.com for queries. After the hugely successful Multiply Artisans Bazaar, Power Plant now brings you ROCKWELL's MOONLIT BAZAAR, another unique shopping experience: shopping till midnight for one-of-kind-Christmas gifts. From October 16 to 18, the Rockwell Tent will be home to a variety of non-fashion items, knick-knacks, home accessories and other unique gift ideas. The Rockwell Moonlit Bazaar will be open from 2pm till 12 midnight at the Rockwell Tent. 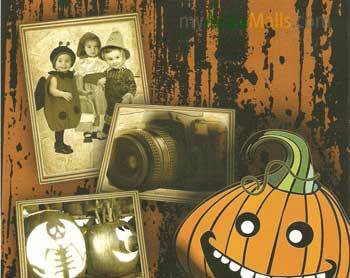 Smart Parenting's Search for the Cutest Halloween Baby Pic! Summit Media and Fully Booked invite all kids to the Foldabots Toy Book launch on October 11, 2009 at the Forum, 4th Level Fully Booked Bonifacio High Street from 2 to 6PM. Activities such as the Foldabots Drawing Contest, Foldabots Collection Contest, Foldabots Quiz Game and Foldabots Assembling Contest await kids. Drinks, snacks and prizes will be available to all kids! A talk on how to make simple appetizers for your parties and how to pair them with the right wines. This week- Pizza! How to make 3 types of easy to make bite size pizzas to be followed by a short talk on wine appreciation. Registration: Fullybooked Customer Service desk at Bonifacio High Street or email at francis_oliva01@yahoo.com or call (0917) 537-5171 and (02) 2157222. This is a message from the Belle de Jour Power Girls CLub I received through Facebook regarding the cancellation of the BDJ Launch scheduled on Saturday. Eastwood City sympathizes with the circumstances brought about by Typhoon Ondoy, especially those greatly affected in the neighboring areas of Marikina, Pasig and Quezon City. It is in this light that Eastwood City Foundation, together with its Holy Family Chapel, will donate 1 Million Pesos to aid the victims of the typhoon. You too can join our drive and help our efforts in the spirit of community service by donating cash, clothes, blankets, bread, canned goods, noodles, drinking water, rice, toiletries, milk, sugar, coffee, vitamins and medicines for common illnesses. Donations are accepted 24 hours at the newly established Eastwood City Donation Center, Ground Floor of 1880 Building, in front of One Orchard Road Condominium. This donation drive is in cooperation with Magic 89.9. For more inquiries, please call the Eastwood Mall Concierge at 709-9888, 709-0888 or 0918-8-EWCITY.